A young soldier had died and was coming home. It was cold. Standing in the kind of wind that mocks wool hats and down coats, our pant legs flapped and eyes narrowed as we affected the Canadian hunch; shoulders up, chins down, and arms crossed. And we waited. Some had flags and the school kids held a small banner. 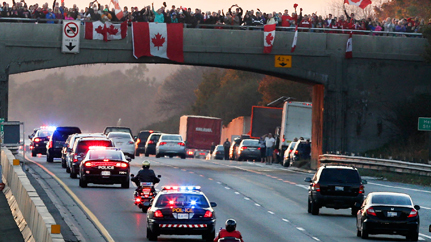 There were more of us atop every highway 401 overpass from Trenton to Toronto; more flags, more kids, and firefighters at attention on their trucks and police officers beside their cars. And then he came. We saw the line of vehicles wavering like black teardrops in the distance. As the motorcade neared, we saw vehicles in front and even some approaching in the other lanes, way over the wide median, pull over and stop. It was there but gone so quickly, like the life we had gathered to honour. 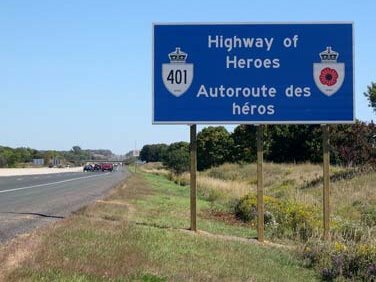 We turned to see the cars disappear down the Highway of Heroes. Some cried, some waved, and some saluted, but there were no cheers. Nobody clapped. It was solemn. There was nothing said. There was nothing to say. Finally, the teacher mumbled something and the silent teenagers were shuffled away. The rest of us went home. That day, like every day, millions of us went home. Parents came home from workplaces that were as much a mystery to the kids as how the refrigerator magically filled itself with food or their dresser drawers with warm socks. And from Nanaimo to Bonavista, parents sat at dinner tables and asked, as they are obliged to, what the kids did in school that day. And they all received the same one word response; the answer every parent knows: “Nothing”. But that evening not everyone came home. There are Labrador men in northern Alberta driving trucks bigger than the boats they left high and dry under big gray tarps. The women now run the town. The young men left first. Then it was their fathers who found more money offered for a six-month stint out there than they could make here in five years. The men with less hair and more belly who had earned their wise eyes and sore backs were soon heading west with the rest. There is a Fredericton nurse in a ramshackle African hospital where medical supplies are currency. The money flows in from the well-meaning West but the young men with guns and old men with Mercedes decide where it goes and it’s mostly to them. And so the young woman with blonde hair tucked under the old blue kerchief, barters for bandages and penicillin. She gets a little bit tougher each time a new grave finds a child who could have been saved. There is a Saskatoon teacher opening a big box in Haiti. Her parents ran the collection and packed it with love and concern and a long, aching letter. The pencils and notebooks are cheap and common back home, but here they move barely adequate to good. And good is measured in smiles that transcend race, gender, religion, and class and all the other phony lines that divide. The kids are like all kids and hungry to learn. Most here, though, are also just hungry. Tonight, the nurse and the teacher and men in the fields are not the only ones not coming home. There are also those with no homes. How many bad decisions in a row did it take to put that man in the holey coat and Rough Riders cap on the Regina sidewalk? How many of the bad decisions were his? How many were made by parents who should not have been parents and social workers with hearts gone cold? How many were made by bosses with eyes on bottom lines urging emasculated men to avoid taking it personally. How many of the bad decisions were made by politicians, whose focus groups smiled at “balance the budget”, “tighten our belts”, and “cut the fat”. And now we scurry by and try not to make eye contact. We try not to think that he has a mother somewhere, and that one night was the first night and first time that he sat on the sidewalk and cried. You are a country of love. Love is easy to find. Go to the park in mid-morning and watch parents watch kids. Go to any airport and see families say bye. Walk down a ways and watch welcomes. There is love. You are a country of hope. It’s hope that sends teachers and nurses abroad. It’s hope that sends fishermen to oilfields and has grandmothers pursing their lips and stepping up. And there is hope in the baby, powdered and new and safe in her mother’s arms, coming home for the first time to a young family doing its best and doing all right. You are a country of redemption. There is no shame in trying and failing. Opportunity knocks over and over again for those who see stumbles as lessons well learned. Like a five year old’s band-aids that steal pain and dry tears, “I’m Sorry” hugs and faith from the loved are the power of salvation and the strength to get up and try again. As it is for us, it is for you. Like you we have scars and memories of bad choices but like you we’re still here and still trying. We understood as we stood on that over pass, shivering but not leaving, and waiting to deliver our silent salute. We understood that you are the home to which we return and that love, hope, and redemption are the gifts you have ready and wrapped and there by the door. Heartfelt sentiments. A loss we never recover. I appreciate your comment. I shall never forget the poignant moments I spent on that overpass as a tiny, minute part of one family’s tragic loss.